A progressive urban workplace’s imaginative design reflects its rural heritage, encourages movement and unifies its team: Hall Chadwick’s exciting new premises by COMUNiTI. 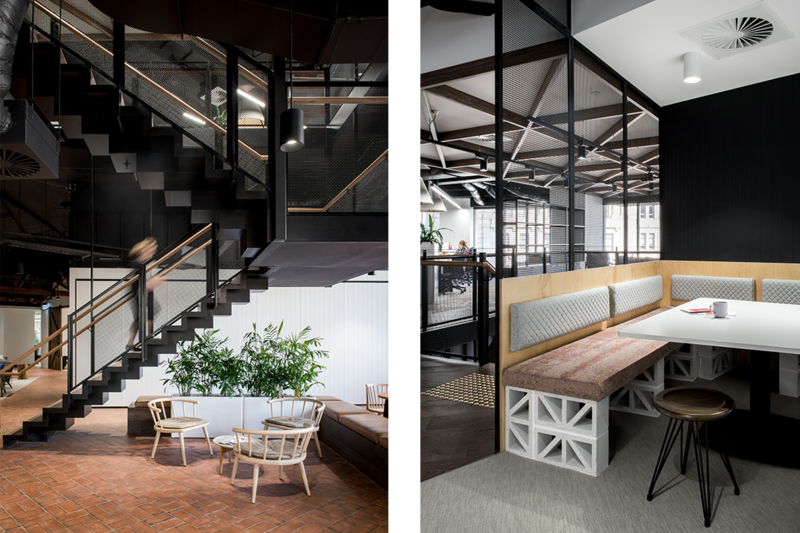 Design group COMUNiTI worked closely with client Hall Chadwick to develop a strategic vision for the business’s new workspace that embraces the past within the context of an exciting future. With around 80 staff in the Brisbane branch, Hall Chadwick is an accounting and business advisory operating in the SME space with a portfolio of clients in agriculture and associated industries. The foundational business, Williams, was established in Longreach, Western Queensland, 40 years ago and while the business has grown significantly, many of the original clients still work with the company today. In 2016 Hall Chadwick’s existing workspace was problematic and a lease expiry was imminent. 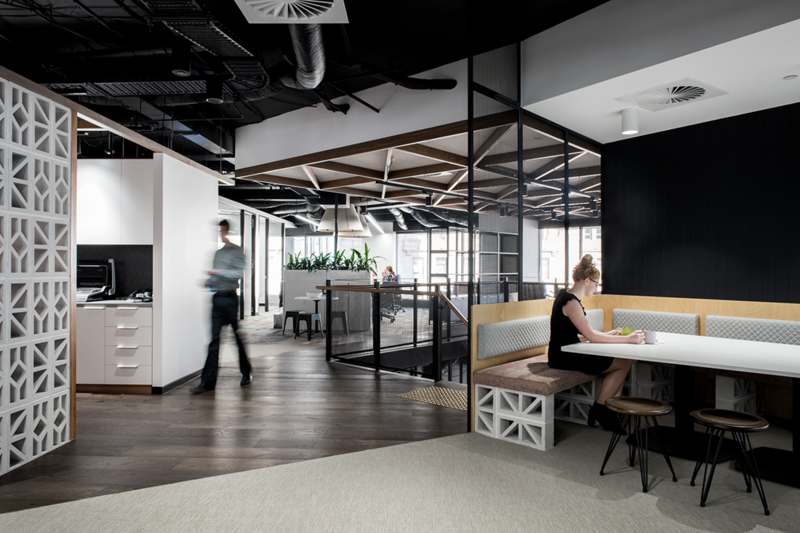 Fifteen years of business growth had spread the staff across two separate and disparate floors, resulting in an unsuitable fit-out and a siloed culture. 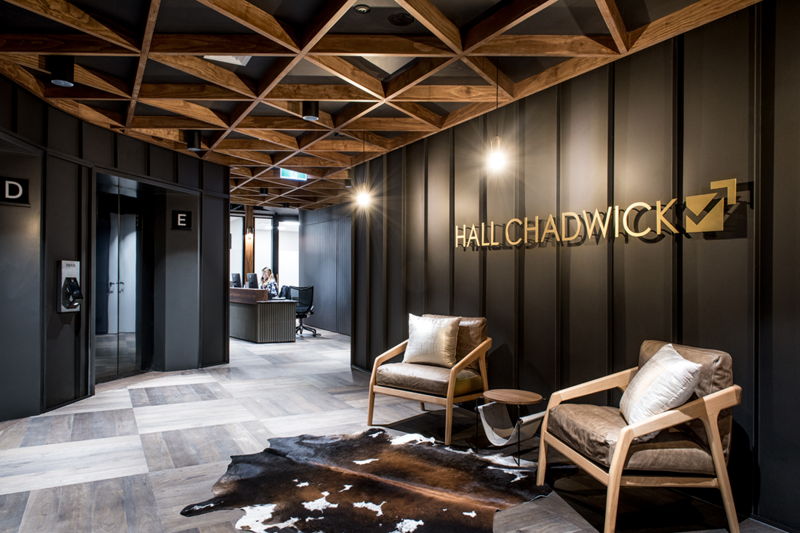 Hall Chadwick engaged COMUNiTI, led by managing director Melissa Marsden, to strategically guide its leasing and fit-out approach, and oversee it to completion. The brief was to reinforce Hall Chadwick’s culture, provide a workspace that was flexible enough to support its evolving operational needs, and a space that their clients felt comfortable visiting, that wasn’t ostentatious. 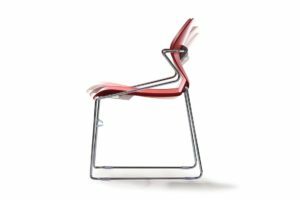 The COMUNiTI team conducted research to gain an in-depth understanding of the business, and to clarify Hall Chadwick’s needs and values. 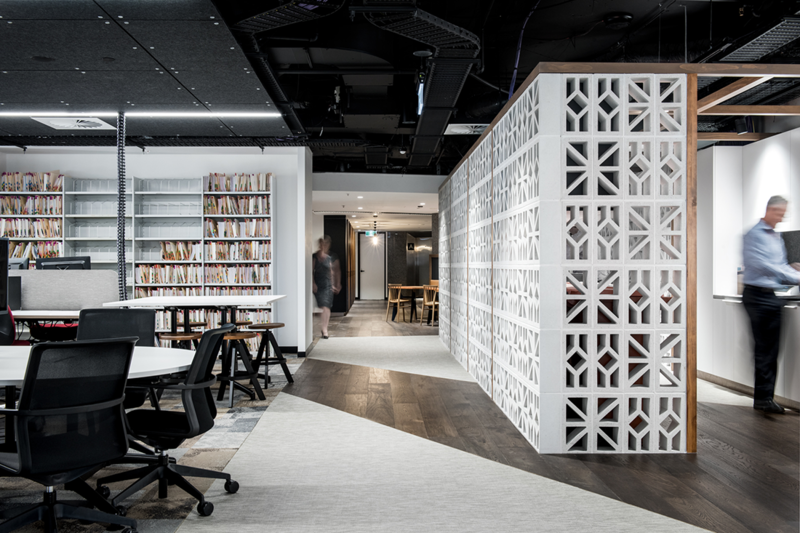 Through imaginative workplace design, COMUNiTI proposed to unify Hall Chadwick’s culture by reflecting the company’s Western Queensland heritage and client base, and to embrace the technological future by creating a more modern, efficient and dynamic business. 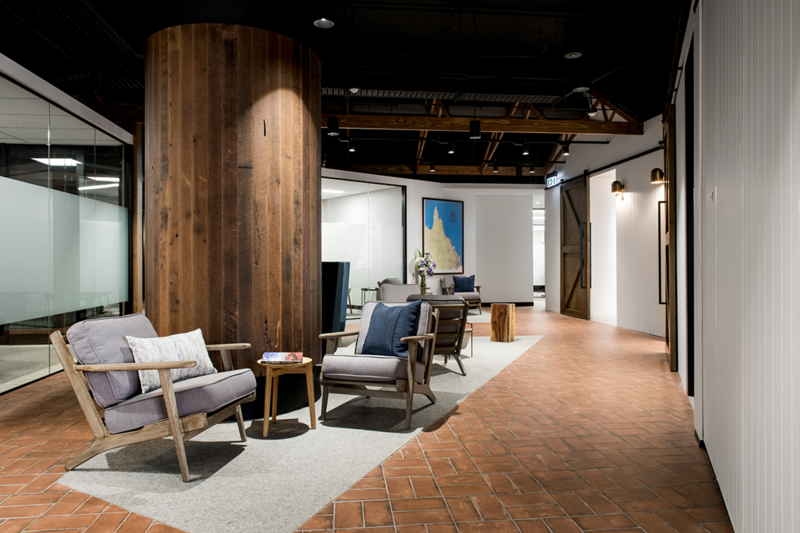 Hall Chadwick took up a new tenancy on levels four and five of a building on the corner of Queen and Edward Streets, right in the heart of Brisbane’s CBD. COMUNiTI’s research suggested that the business’s organisational and cultural requirements could be addressed across two contiguous floor plates if a central staircase was provided and the floor plates were a minimum of 800-square-metres. 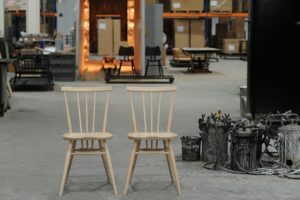 The tenancy was taken on as a cold shell, which provided greater flexibility and funding for Hall Chadwick to execute its vision for the space. 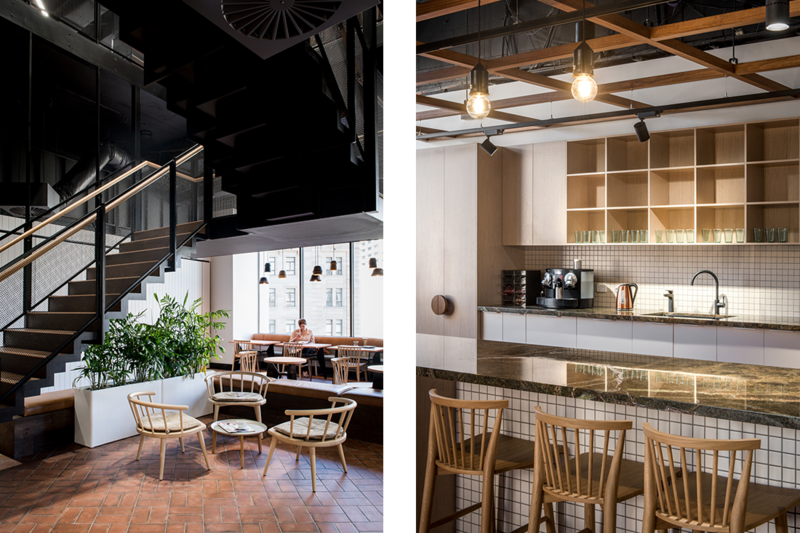 Just over a year later, the fit-out is complete with a distinctively refined yet rustic aesthetic. 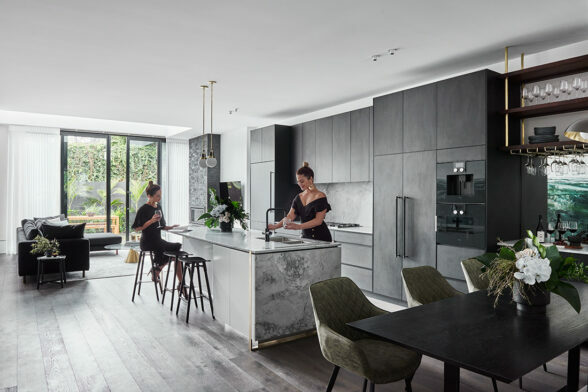 “The space subtly reflects rural Queensland through the colours, material selections, textures and architectural forms,” explains project lead, Melissa Marsden. Stepping out of the lift into the entry foyer, the Hall Chadwick story immediately starts to unfold. 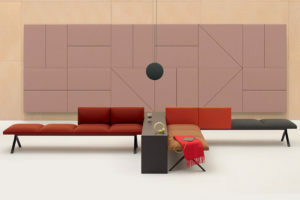 Considered materials and a warm colour palette are reminiscent of Western Queensland, including reddish timbers, charcoal Colorbond vertical panels, warm greys, and rust. And what rural Queensland space would be complete without a cowhide rug. Moving from the foyer the entry narrows into a reception area, featuring a desk clad with sage tiles inspired by corrugated sheets in front of a waiting lounge area. Wrapping around the waiting lounge are client meeting rooms, a boardroom and a training room. 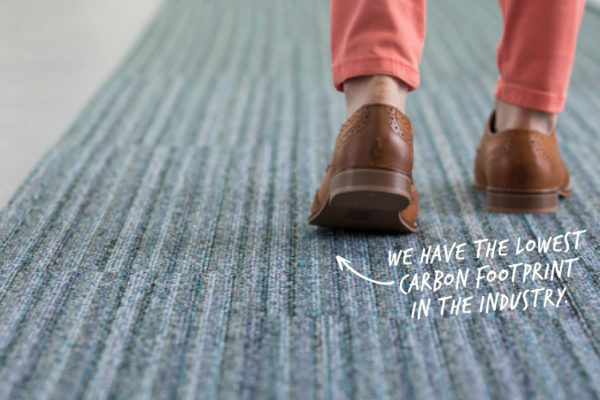 Floor tiles in a basket weave pattern and red dirt palette provide wayfinding to the area. The ‘red dirt’ path traverses the waiting lounge to the boardroom and training room, with their heavy barn-style, sliding doors. The boardroom, with its handsome pitched barn roof, has been designed to be like a rural “building” within the space. VJ boards nod to traditional Queenslander architectural vernacular, however the view of neighbouring highrise buildings and the office furniture clearly position the “barn” within the Brisbane CBD. 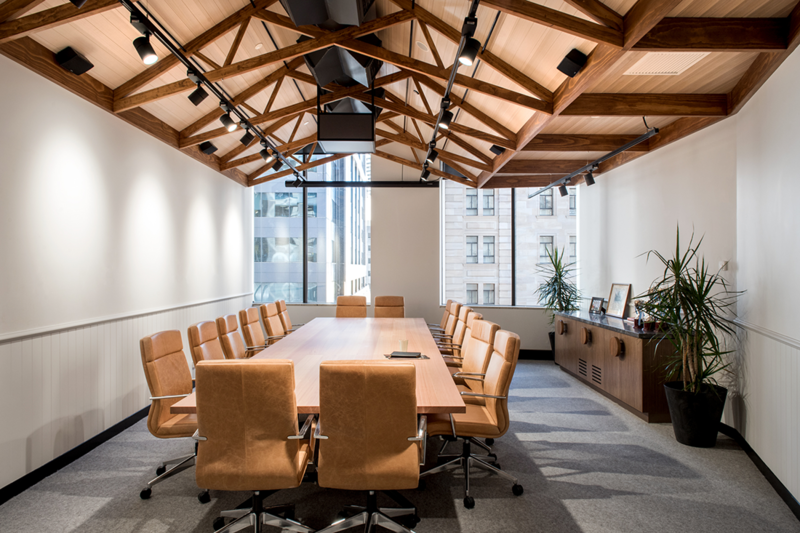 The impressive timber truss ceiling extends out into the client waiting lounge, creating engaging interior views and continuity within the larger workspace. 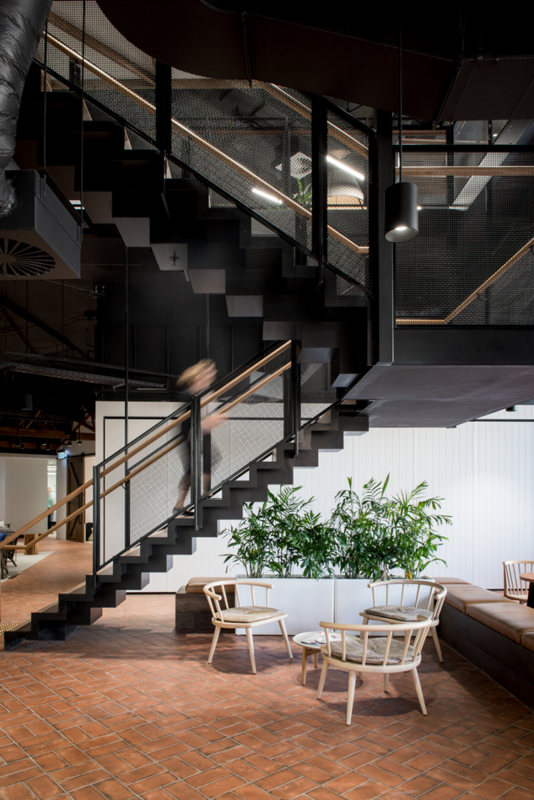 Beyond the client waiting lounge, the staircase forms a transition point between the client space and the staff café. 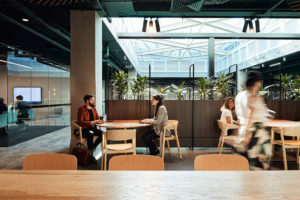 Centrally located, it encourages movement between the floors drawn by the café and client-facing spaces on level four. 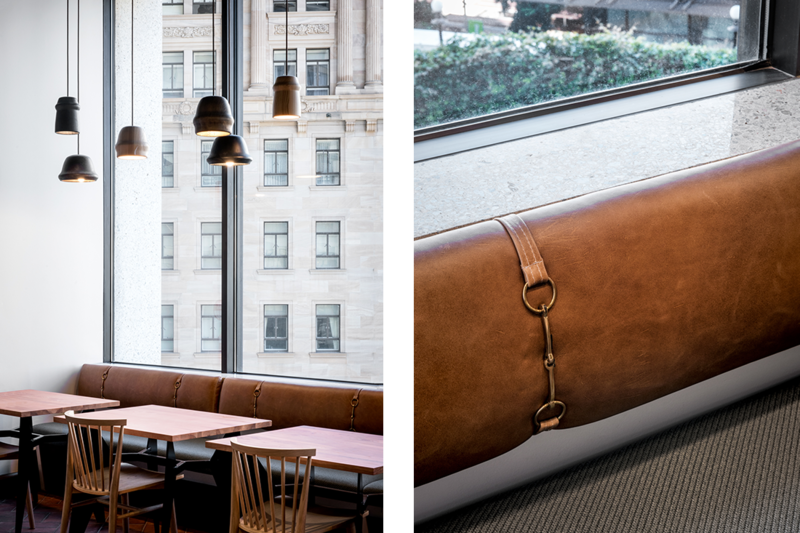 The café’s large perimeter windows offer views down bustling Queen Street and flood the space with natural light. Solid timber furniture, refined upholstered seating featuring horse bit buckles, staggered pendant lights, and a stone top kitchen bar create a relaxed, modern restaurant vibe suitable for a broad range of uses: a relaxing alternative working space for staff, a casual meeting place with clients, a function space for events, and of course, Friday drinks. Climbing the industrial-style staircase to level five you are welcomed into the heart of the working floor. 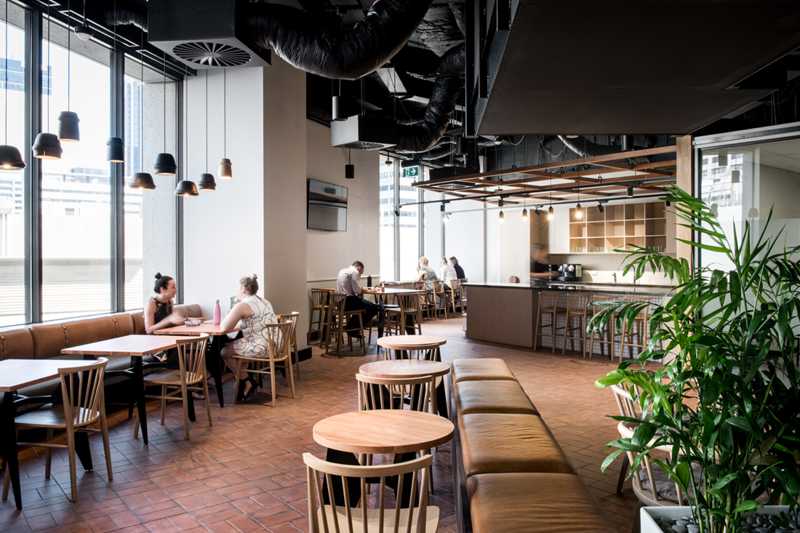 Here a communal centre provides staff with collaboration spaces, a utility/print area and tea points, encouraging activity and informal communicative opportunities. 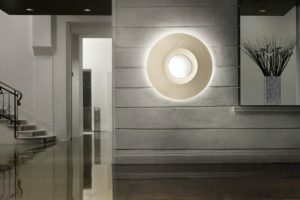 Playful placement of a breezeblock wall separates the main corridor from the utility space, simultaneously enabling visual connection across the office. It is hard not to love the breezeblock – their distinct Australian outdoor style proffers nostalgic, mid-century modern appeal. 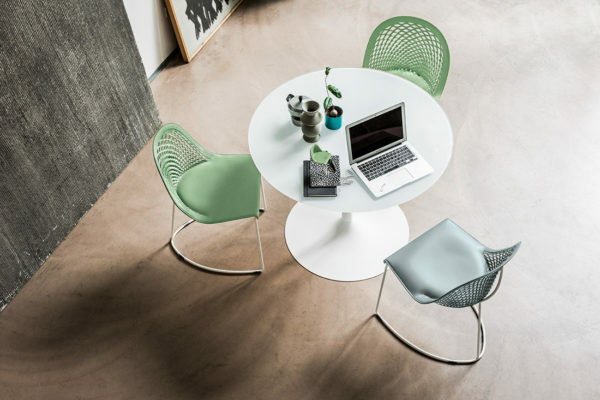 Widely used in Western Queensland, in turn they are used to great effect in Hall Chadwick’s new workspace. 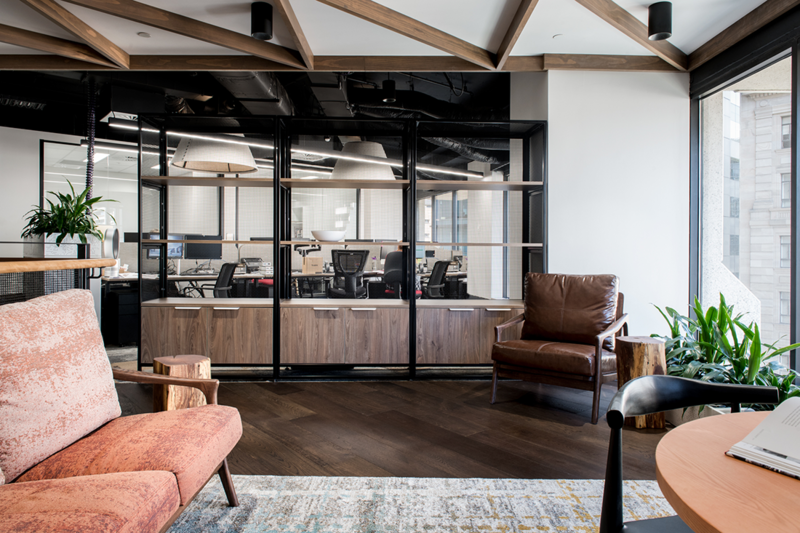 “The space creates a feeling of openness and expanse that is then scaled back to feel intimate and personal – it’s homely yet professional in a way that is atypical of a corporate office,” explains Melissa Marsden of COMUNiTI. Collaborative spaces extend off the communal centre. Their positioning in public areas encourages knowledge sharing between departments and informal contributions from passing staff. The workstations are fanned around the curved perimeter of the building, with offices stacked back off windows so natural light can penetrate deep into the floor plate without obstruction. Work stations are all electronically height adjustable and media spaces at the end of workstations offer progressive technology, empowering teams to come together to view, share and discuss spreadsheets on a larger screen. 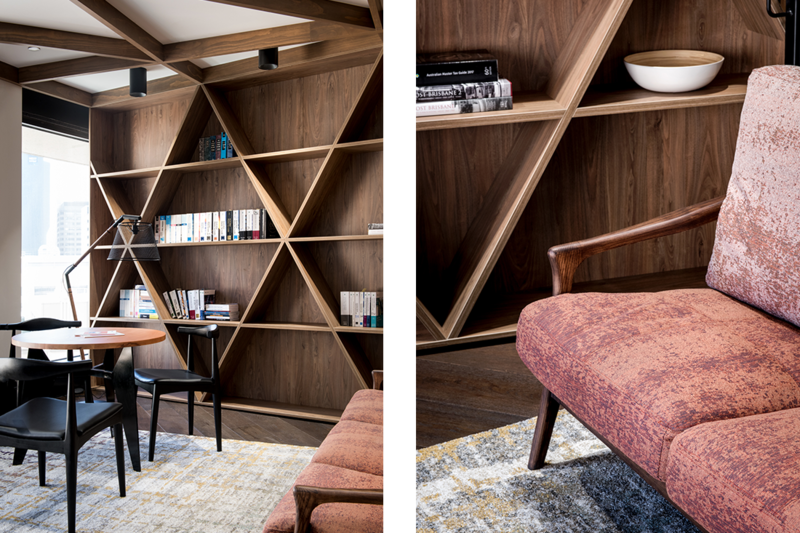 Finally, a quiet library space sits behind the stair void, its rustic tones and textures offering a peaceful work environment away from the desk with views up Queen Street. The triangulated timber ceiling echoes the entry foyer on Level four, bringing the Hall Chadwick workplace story full circle. 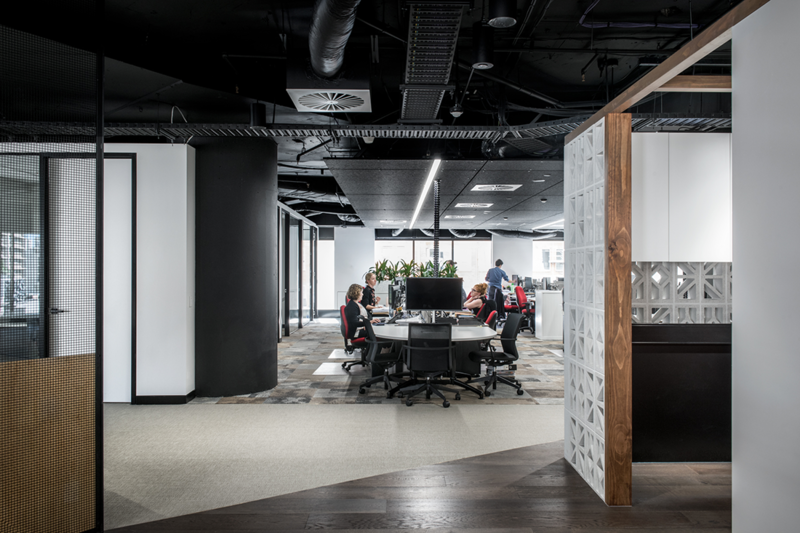 The refined yet relaxed results clearly resonate: “Melissa brought creativity, flair and functionality to the design which gives a nod to our history, yet still provides a practical workspace for today,” says director of Business Services, Dugald Warby. 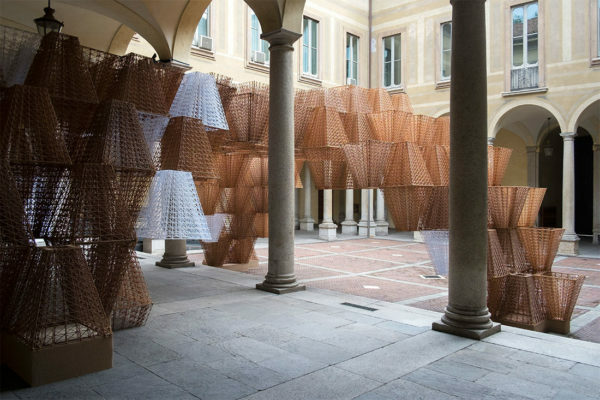 Explore our workplace archives here. And don’t miss out on engaging content, sign up for our newsletter.